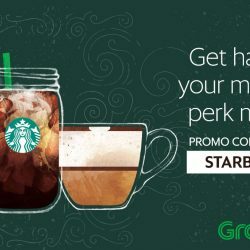 GrabFood: Grab $1 Deals from Chachako, Mr Bean, Sharetea & SriSunPrata.com with No Delivery Fees! 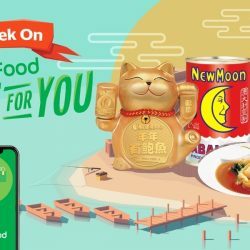 $1 GrabFood Deals just got bigger & better! You now have 4 deals to enjoy every 2 weeks, for $1 with no delivery fees. Which one are you getting first? Chachako Singapore Tom Yum Pasta + Drink, Mr Bean Singapore Wholemeal Oreo Cheese Pancakes + Soy Milk, Sharetea Singapore (歇脚亭) Okinawa Milk Tea (M) + Mixed Berries Iced Tea with Aiyu Jelly (M) & SriSunPrata.Com Mee Goreng + Egg, all at $1 each with no delivery fees! Start ordering 2PM daily, this 4-17 March 2019 while stock lasts. T&Cs apply. KFC: Enjoy a 1-Pc Chicken Meal for only $3.30! 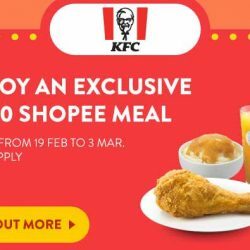 Great deals go hand in hand with delicious meals — in conjunction with Shopee 3.3 Shopping Carnival, KFC is offering a $3.3 Shopee Meal while you shop! Simply enter code at the Promo Code Page or during checkout to enjoy this deal online! 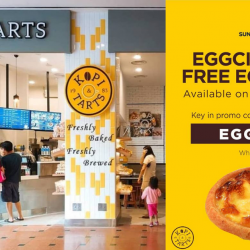 Promotion is valid for Dine-in and Takeaway online orders till 3 Mar 2019. T&Cs apply. 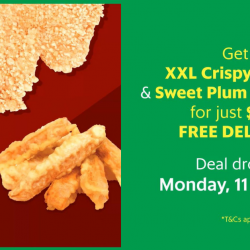 11 - 17 Feb 2019 GrabFood: Get a XXL Crispy Chicken & Sweet Plum Potato Fries from Shihlin Taiwan at only $1 with FREE Delivery! From 11 - 17 Feb, snack on Shihlin Taiwan’s XXL Crispy Chicken and Sweet Plum Potato Fries for only $1 and enjoy FREE delivery on GrabFood! Available from 2PM daily. Limited redemptions daily but quantities refresh everyday. 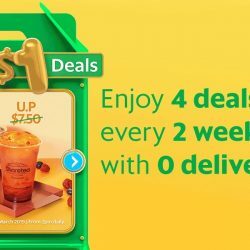 28 Jan - 3 Feb 2019 GrabFood: Get a 2pc Chicken Meal from Arnold’s at $1 with FREE Delivery! Feeling peckish? 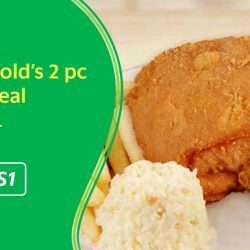 Get a 2pc Chicken Meal from Arnold’s with FREE delivery. All for only $1 via GrabFood! While stocks last! Promo valid from 28 Jan -3 Feb from 2PM onwards, for both new and existing users. Limited redemptions daily but quantities refresh everyday. 21 - 27 Jan 2019 GrabFood: Use Promo Code to Get 30% OFF New Moon Abalone products with FREE Delivery! Did you know? ‘Bao Yu’ sounds like ‘guaranteed wealth’ in Mandarin. While we’ll leave the wordplay to the sumptuous shellfish, here’s a deal that’ll guarantee great value and convenience this Chinese New Year. This 21-27 January 2019, use promo code for 30% OFF New Moon Abalone products on GrabFood! Pre-order yours from 8AM -12PM daily, and receive it between 2 - 6PM! 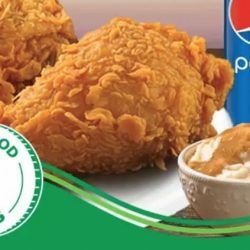 14 - 20 Jan 2019 GrabFood: Get a 2pcs Popeyes Chicken Combo at only $1 This Week! Order a Popeyes Chicken Combo (2pcs) from GrabFood with FREE delivery. All for only $1. Orders start from 2pm daily. While stocks last! 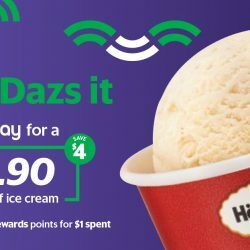 Promo is valid from 14-20 Jan 2019, for both new and existing users. Quantities refresh daily. Other T&Cs apply. 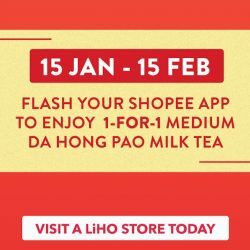 15 Jan - 15 Feb 2019 LiHO: CNY Special – 1-for-1 Da Hong Pao Milk Tea with Brown Sugar Pearl! Calling out to all Shopee users! Enjoy LiHO's CNY special 1-for-1 Da Hong Pao with Brown Sugar Pearl! Valid from 15th Jan to 15th Feb 2019. Just flash your Shopee's app and like LiHO's IG to redeem! 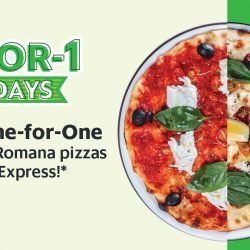 14 Jan - 30 Dec 2019 GrabFood: Get 1-for-1 Pizza from PizzaExpress Every Monday! Pizza lovers, your favourite deal is back! All you have to do is place your order via GrabFood, or pay with GrabPay at any PizzaExpress outlet, no promo code needed. 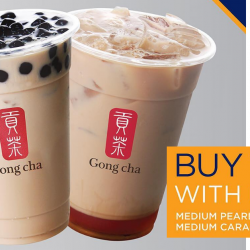 Till 27 Jan 2019 Gong Cha: Enjoy 1-for-1 Medium Pearl Milk Tea or Caramel Milk Tea with KrisPay! Who doesn’t love a good 1-for-1 deal? 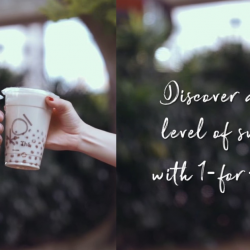 Enjoy a 1-for-1 on Gong Cha's medium Pearl Milk Tea and medium Caramel Milk Tea when you pay with KrisPay! 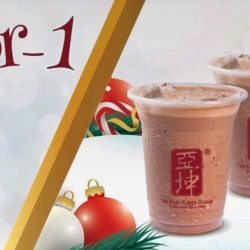 Till 13 Jan 2019 Ya Kun: Enjoy 1-for-1 Iced Milo via Ya Kun App! If you aren't a fan of caffeine, this is the offer for you! Grab 1-for-1 Iced Milo via Ya Kun app now before the deal is gone! Just pay $2.80 to secure this deal on the app. Promotion is valid till 13 January 2019 for the first 2000 customers. 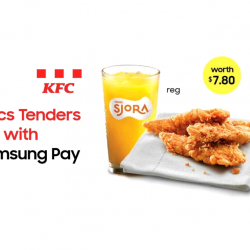 Till 7 Jan 2019 KFC: Pay only $2 for 3pcs Tenders Set with Samsung Pay! Samsung phone owners, enjoy a 3pcs KFC Tenders Set for only $2 when you pay with Samsung Pay! Valid till 7 Jan 2019 or while stocks last. 10 - 16 Dec 2018 Burger King: Get a FREE Chicken Fries & SJORA Drink (UP $6.50) with Any Purchase! 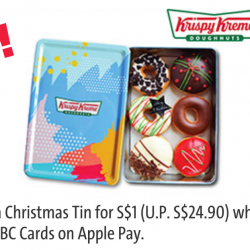 [Naughty or Nice Holiday Treats] If you ain't using the BK app already, it's time to get on it! 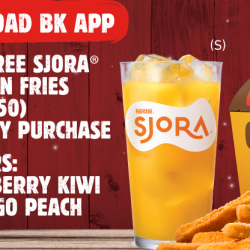 Show the app from your phone to redeem a free Chicken Fries and SJORA drink with any purchase! Only at Burger King. T&Cs apply. 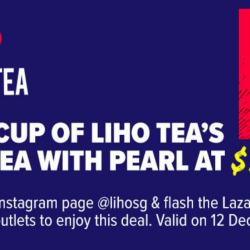 On 12 December 2018, head down to any LiHO outlets to get a cup of LiHO Tea's Milk Tea with Pearl at only $1.20! All you need to do is to like LiHO's instagram page @lihosg and flash the Lazada app to redeem! 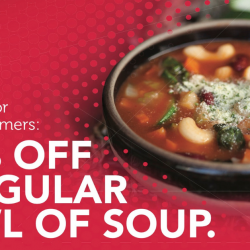 Valid on 12 December 2018 only. 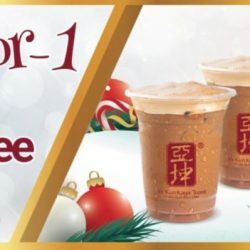 Till 19 Dec 2018 Gong Cha: 1-for-1 Drinks for Singtel Customers! 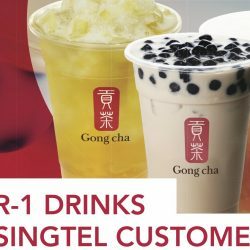 My Singtel app Exclusive: Get 1-for-1 drinks at Gong Cha! Choose from: Pearl milk tea, Earl grey milk tea, Milk foam Oolong tea and Honey lemon green tea. FREE drink must be of the same drink ordered. SEPHORA BLACK FRIDAY 2018 IS COMING SOON! ARE YOU READY?! 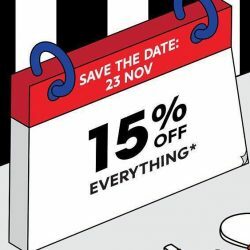 For ONE day only, get 15% off everything on 23 Nov from 12am - 11.59pm, and in stores from 9am - 10pm. Earn a chance to be one of the 28 lucky beauties to win a Skin Inc Optimizer Voyage Tri-Light++ device & serum set worth $496 when you make a purchase during Black Friday! 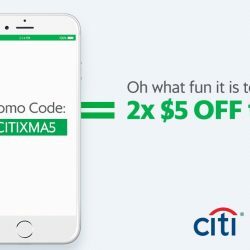 Plus, get a $8 voucher with a minimum spend of $120 with your Citi Credit Card. What are you waiting for? Wishlist your items now!